Who doesn’t want a spa-like bathroom, a spacious custom closet, and a gourmet kitchen at their next duty station? We can all dream. Champagne tastes on a BAH budget aside, there’s nothing wrong with dreaming big. Many military families have successfully met their champagne tastes on their bubbly BAH budget by making smart, strategic choices about their home renting or purchasing. A well-thought out strategy, as any military family knows, is vital for the success of the mission. In the case of “Operation: Sell or Rent My Home before My PCS,” you need a well-thought out strategy to get the best Return on Investment (ROI) on your home sale that your budget can afford. So, if you’re a military family homeowner, then now is the time to plan your real estate exit strategy: Will you sell or rent out your home when orders arrive? Regardless of which option you choose, you can help other military families relocating to your area realize their champagne tastes by making just a few simple renovations to your home. Don’t worry, though, you don’t have to make any investment just for the betterment of the military community; there’s a big benefit for you, too! Second, now that we know that buyers are looking for, we know that we don’t need to waste the dollars you do have for renovations on upgrades such as hand-scraped Amish wood floors to attract buyers (though they are pretty!). Your plan of attack should instead focus directly on these three target areas identified. The typical ROI for a complete bathroom overhaul is around 85 percent, making it one of the most worthwhile renovation investments you can complete. 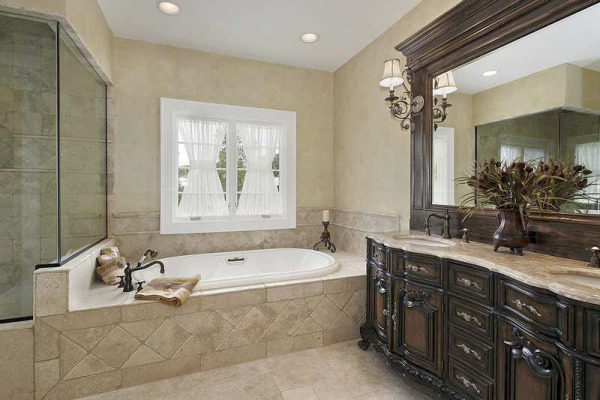 You don’t need to completely overhaul the bathroom to get it ready to sell, though. Instead, replace the fixtures, mirror (remove that 1980s looking builder-grade mirror immediately! ), and the countertop. Without having to take large structural repairs into account in this simple renovation, you can easily double your investment in this bathroom with a relatively simple DIY weekend project. If your tiles are looking worse for wear, it’s okay to replace them with textured vinyl. Fortunately for home sellers now, vinyl is fashionable; the next owner will likely have to replace the vinyl with something more expensive when trends change. This one follows closely behind the master bathroom for both men and women. If you’re selling in a military-heavy community, don’t think that service members aren’t interested in a spacious closet just because it looks like they wear the same thing every day. Not only do the uniforms take up a lot of space, but they have multiple types of uniforms: utility uniforms, dress uniforms, PT uniforms, bags, boots, badges, and then they have their casual wear like the rest of us (and hopefully a nice date outfit or two). If you can take down a wall or make more space, head to a storage solutions shop such as The Container Store to add built-ins that create both more functional room for storing clothes the as well as the illusion of more space. You don’t want your prospective buyer to instantly reject your home once she takes a peep at your bursting-at-the-seams closet, do you? Even if the buyer only uses the granite countertops for displaying take-out boxes, a gourmet kitchen inspires foodie aspirations in everyone. A gourmet kitchen isn’t exactly a kitchen on a budget, though, but you can make some inexpensive updates. Replacing the hardware and faucets in a kitchen, for one, will only set you back two or three hundred dollars, but will significantly update the look of your kitchen. (Check out a Habitat for Humanity Re-Store for new or gently used hardware.) If you have a little more in your budget, you may also be able to score a great deal on flooring, new cabinet doors (you don’t need to replace the entire cabinet), countertops, and even a new sink. Let’s say your budget is stretched just a little too much by one too many PCS demands by Uncle Sam. There are a few less expensive ways that you can still improve your ROI on renovations in time for moving season. Paint is cheap. You don’t need to repaint your entire house, but you do need to touch it up. If your walls aren’t neutral, prepare for a full weekend of painting over them. Stick to neutrals such as tans and light grays. Elbow grease is free. Declutter, donate, and scrub your home. Only house flippers want to buy the dirty house on the block. Consumer Reports estimates that clearing out and cleaning up your home can help you increase the asking price of your home by up to 5 percent! If you have an average-priced home—roughly low $200s—a 5 percent increase makes for a pretty well-paid cleaning job for you. A couple hundred dollars can get you out of your mortgage more quickly. Creating a cheery, welcoming entryway will cost you less than a couple of hundred dollars (less if you’re even more frugal) with a bright coat of paint (okay, you can use some bright paint in your home), a new welcome mat, a seasonal wreath, and a couple of potted plants. It may not boost your home’s asking price, but getting a buyer with an offer in the door sooner can help get you out of the door, and out of that mortgage payment, more quickly. That may be one of the best ROI’s you can make! Now that you know how to get the target the best bang for your ROI buck in renovations, take advantage of the time before you PCS to start executing your mission and getting your home on the market!